Images courtesy of Legat Architects. Tom Livingston, president of the Village of La Grange, Ill., reflects with fondness on the Stone Avenue Train Station. “My father took the train out of this station for forty years. It’s a real workhorse,” he said. However, time had taken a toll on the century-old station: rusted gutters, rotting wood, peeling paint, a deteriorated roof. The workhorse needed mending. In 2005, the village launched a restoration effort that would truly “take a village” to pull off. It would require the input of a wide range of resources, ranging from village officials to legislators, railroad representatives, and community organizations. On a warm October morning last fall, Livingston and the La Grange community celebrated the project’s completion. The 900-square-foot station, with its locally quarried limestone and bold arches, now gleams with as much charisma as it did when it was built in 1901. Masonry arches and built-in seating add to the train station’s allure. La Grange has long been a railroad community. Railroad service began as early as 1864 and by 1869, commuter rail service connected the village to nearby Chicago. In 1870, Franklin D. Cossitt purchased 600 acres of land adjacent to the railroad. Nine years later, the Village of La Grange was incorporated. The Stone Avenue Train Station exemplifies both the Classical and Richardsonian Romanesque styles. 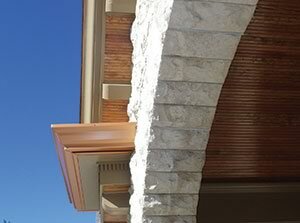 Heavy, rusticated stone arches, gabled roofs, and wood dentil detailing define the station. The limestone of the outer gallery walls likely was sourced from a local quarry. 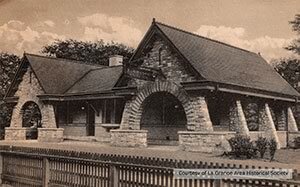 The La Grange Area Historical Society designated the station a local landmark in 1971. Over the years, the station endured several renovations, which replaced many of the original features with less-than-historic versions. Early 20th century image of the train station. 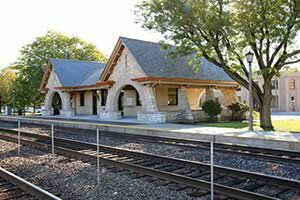 The village secured funding for the anticipated $1,085,000 project through two primary grant sources: Congressman Dan Lipinski ($700,000 grant) and the West Suburban Mass Transit District ($385,000 grant). The project was competitively bid and awarded to Boller Construction of Waukegan in 2013. The unearthed documentation influenced material and fixture selection, including the identification of period-correct light fixtures outside and new chandeliers inside. Additionally, the team replaced plain aluminum doors with aluminum-framed oak doors and repainted with historically accurate colors. Designers also had to be respectful of the village’s budget and maintenance constraints. There was a careful balance between choosing affordable, contemporary materials and creating authenticity. For instance, 100-percent recyclable and durable polymeric slate roof tiles replace the damaged asphalt shingles. The new tiles are a cost-effective alternative to traditional slate and require much less maintenance. The project scope also addressed historic platform signage. Legat used the 1901 station plans to recreate the design of the original carved wood and metal platform sign. 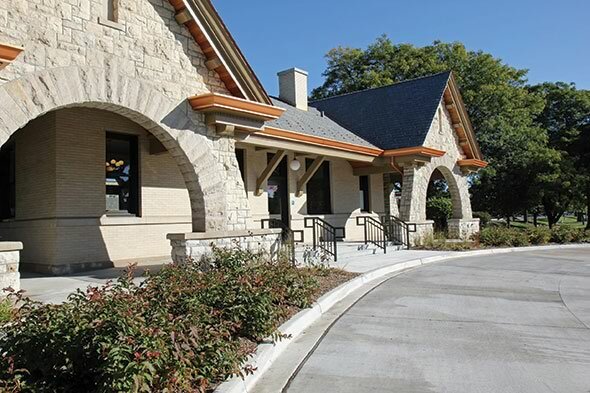 Additional repairs included landscape improvements (design courtesy of the La Grange Garden Club and Hitchcock Design Group) to make the station more inviting with beautiful, yet accessible outdoor spaces. 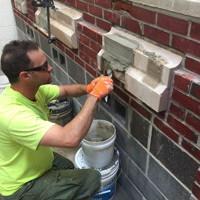 Among the improvements to the station are tuck-pointed limestone and restored dentil molding, as well as new gutters and stained oak beadboard. The Village of La Grange has a long-standing tradition of preserving its past. Turn-of-the-century homes in many styles enrich its large historic district. The thriving downtown includes a tapestry of buildings dating from the late 1800s. In the last century, the village has transformed from a quaint shopping town to what Livingston calls “a transit-oriented, vibrant downtown.” Indeed, the village has been fortunate to receive several recent accolades, including one of the “Best Places to Live” and “Best Downtown” by Chicago magazine and “Top Transit Suburb” by the De Paul Chaddick Institute. The workhorse is back on track. Marc Rohde, AIA LEED AP, is director of municipal architecture at Legat Architects. Douglas Ogurek, LEED AP BD+C, is communications manager at Legat Architects. In 1835, when the Pemaquid Point lighthouse was built in Bristol, Maine, the American paint industry did not yet exist. Portland cement technology was still more than three decades away from reaching the United States, and prepackaged paint production would start even later. Yet the stone lighthouse, built utilizing the best technology of its time, endured severe coastal exposures for 172 years with only minimal maintenance. 10 October 2017 — PROSOCO and CONPROCO have reaffirmed their commitment to product training and support for restoration professionals by co-founding the Restoration Training Collaborative (RTC).